“I didn’t choose love, it chose me.” Emily Hudson, on September 11, 1857. Based on one of America’s most horrific, historical events, this is the story of an improbable romance between two nineteen-year-olds from starkly different worlds, Jonathan, the son of a Mormon bishop and Emily, the daughter of a Christian pastor. In a beautiful, pristine valley called Mountain Meadows, surrounded by an atmosphere of fear and hatred, Jonathan, tormented by the execution of his beautiful mother by a lecherous apostle, falls in love with beautiful, spirited Emily. Ordered to spy on the wagon train by his father, Jonathan tames a wild, magnificent black stallion and wins the heart of the girl who has captured his. The Mountain Meadow massacre was an act so atrocious it was kept shrouded in secrecy for over a hundred years. Mormons, driven by a despotic Brigham Young who thunders chilling messages of Blood Atonement from the pulpit, commit polygamy, murder, and castration in the name of God. But unforgiveness and revenge cannot stop a love so great, it refused to die, or muzzle a story so amazing, it struggled to live. In the end, this is Jonathan’s story. In the midst of the massacre, Jonathan must choose between his brother and his faith, or Emily. As Jonathan races to save Emily, the reader is left breathless with heart-pounding anticipation as the scope and magnitude of their love amidst the searing fire and ashes of the Mountain Meadow Massacre dramatically, and unforgettably, unfolds. 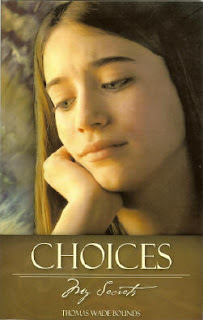 Choices, My Secrets, tells the compelling story of Rachel, a teenager faced with confusing choices leading up to and during a summer romance that left her pregnant. Searching for hope things spin out of control. Does a chance encounter help her think clearly? Learn whether she finds more issues while leaving out the possibilities to talk with friends, family and God. Does she find her true self and gains the faith hope and courage to consider the best choices to guide her through her incredible journey. Learn Rachel’s experience without having to live it yourself. A great book for teens, parents and churches, brings back the art of conversation, an easy way to talk about teen choices together and helps set expectations and family values and godly goals.